Among those who oppose the government there is an overwhelming feeling that the opposition should stand together somehow to defeat Mahinda Rajapaksa. You also oppose the Rajapaksa regime. How come you are standing independently? The United Socialist Party continues to participate in protests and all sorts of action against the undemocratic and brutal regime in power. We were prepared to work with various parties and organisations, despite sharp political differences, in order to get rid of the dictatorial regime. However, the USP has never made any opportunist alliances with capitalist parties. There is no doubt that this regime must go. We call for mass mobilisation against it. We are also more concerned with what replaces the government once we get rid of the Rajapkasa dictatorship. Remember what happened in 1994. There was massive pressure to end the 17 year rule of the capitalist UNP. That party was defeated but the people did not get what they wanted – a reversal of the neoliberal ‘reforms’ that the UNP carried out in the ‘80s did not take place. Similarly there is now pressure to get rid of the nine-year rule of this horrific regime. But will the people get what they want? None of the candidates stands for the rights of the people – or is prepared to deliver these genuine reforms after the election. They all are representatives of capitalism. Even in the case of a victory for the main opposition candidate, Maithripala Sirisena, the policies of Mahinda will continue to be implemented. Look at the way the two main capitalist parties are swapping people. Maithripala has only just left the ruling SLFP to join forces with the UNP. (He was the party’s Secretary as well as a minister.) Meanwhile the UNP’s general secretary, Tissa Anthanayaka, has left the UNP to join the SLFP. It is further proof that there is no difference between these two capitalist parties. Choosing among them is not a real choice for the people. There is no viable alternative given to the voters. This is why I am standing. I am standing independently to provide an opportunity for the people to reject the current regime and add their voice to the demand for the creation of a better economic and political system that serves us all. What are the demands that you are putting forward? The mere demand for the abolition of the executive presidency alone will not be enough. The Sri Lankan constitution is constantly changed to be suitable to the capitalists and the ruling elite who represent them. Tamils, Muslims and other minorities are left out of it. It’s a major obstacle for the Sinhala workers and all other poorer sections of the country who are demanding better living conditions, a decent minimum wage, etc. In our programme we include the demand for annulling the present constitution and the formation of a democratic revolutionary constituent assembly consisting of elected representatives from all sections of the society. This democratic body can then decide what kind of constitution they have and what kind of economic plan they want to implement. We also demand that the privatisation of education be stopped immediately. Adequate funding needs to be allocated for education. Health services must be kept free of charge. 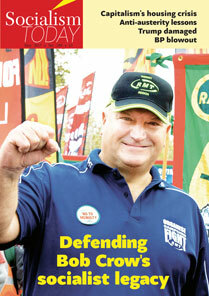 We have seen public workers strike and demonstrate demanding decent wages. Rises in inflation are not matched by wage increases in the public sector or in the private sector, including in the ‘Free Trade Zone’ where most garment workers are forced to work on slave wages. The skyrocketing defence spending and enormous expenditure for the executive presidency should be cut and invested in wages and services. The Tamil-speaking population has suffered immensely over the decades. I and my party stand firmly in support of the rights of the Tamil-speaking people and their ultimate right to self determination, including the right to secession if that’s what they desire, with the rights of all minorities safeguarded. The rights of Muslims, including their religious rights, are now being viciously attacked by the Sinhala Buddhist chauvinist extremists such as Bodu Bala Sena. We have campaigned against this and been attacked for it, including physically. This persecution must end immediately. These are some of the demands which we put forward. Our economic demands are not abstract. We explain that they can be implemented by carrying through the nationalisation of key sectors of the economy under democratic workers’ control and implementing a planned economy. This can only be possible with the participation of the masses in government. We also explain that fighting for these demands has to be linked to getting rid of casino capitalism and achieving a socialist transformation to ensure a society to benefit all rather than benefiting only the few, like we see today. We understand that the USP had discussions with others with the aim of producing a common left candidate. Why did it fail? It would have been excellent if some left forces came together to put forward a common left candidate. We had discussions with other groups. Unfortunately we were not able to come to an agreement particularly on some aspects of the programme that we should stand on. Particularly we could not reach agreement on the national rights of Tamils. The Frontline Socialist Party rejected the demand for self-determination for Tamils and the demand for withdrawal of the military from the North and East. The USP did not plan to stand in the coming election, hoping to agree on a possible left common candidate. With this view we participated in a number of discussions with the FSP and others. We are standing in the election to provide an alternative to the rotten capitalist parties and their policies and build opposition to achieve real change. This means we must stand firm with a clear left and socialist programme and use the opportunity to highlight what is the way forward to get rid of all discriminations and exploitation in society. Given the current situation in Sri Lanka where systematic attacks are taking place against workers’ rights, the rights of Tamils, Muslims and other minorities, left organisations should unite together to put forward a fighting programme. We campaign for the creation of a mass party of workers, poor farmers and fishermen and youth that can articulate their interests against the capitalists and their parties and institutions. We argued energetically for this, putting a lot of effort in, and participated in several meeting with parties such as the Frontline Socialist Party. Unfortunately the FSP did not agree to these demands and held a separate meeting with some other organisations to which the USP was not invited. Nevertheless we had further discussions with the FSP and came to the decision to stand separately. This of course does not mean that we completely reject all of the programme that the FSP is standing on. There are a number of demands, such as opposition to the privatisation of education, on which we can work together. Can you say a little more about the left in Sri Lanka? Over the decades, the working class in Sri Lanka has gone through a bitter experience of betrayal by various leaders in the ‘traditional left’. When we stood in the election in 2005, warning against Sinhala nationalism, the so-called Marxist party, the JVP, campaigned for those very same policies within the UPA. The rump of the LSSP and the CP and formerly principled leaders like Vasudeva Nanayakara are all in the same nationalist camp and silently witnessed the most grotesque massacre in our history. 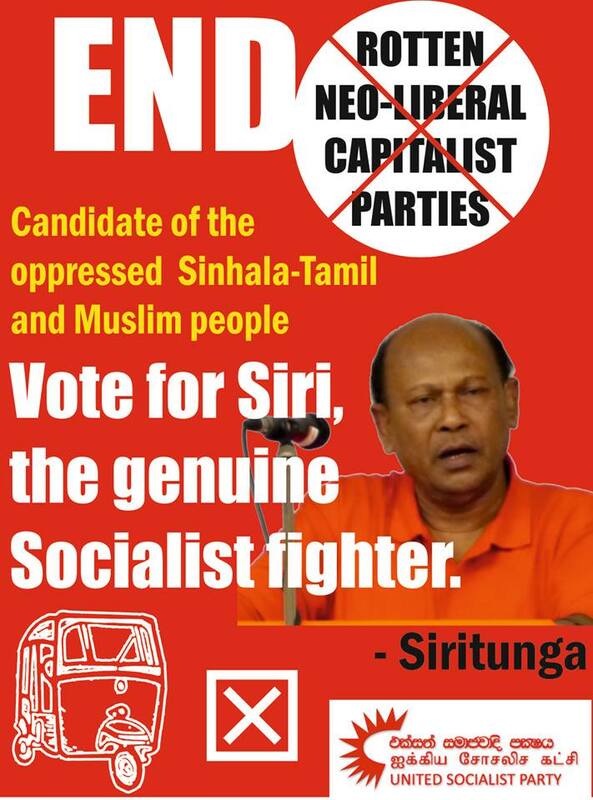 This is on top of the gross betrayal by the Lanka Socialist Party (LSSP), once a mass Trotskyist force, which joined the capitalist parties in government in the ‘60s. Unfortunately this process is now repeated by Wikramabahu Karunaratne, who was opposed to this betrayal. 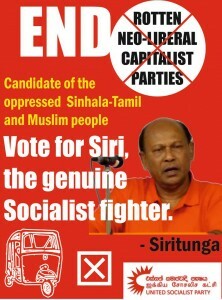 In this election he has renounced his socialist principles and is openly supporting the capitalist UNP. Though the FSP broke from the JVP, in many of its policies and programmes they have still not completely broken away from their old ways. We believe that, in these circumstances it would be a terrible mistake to compromise the programme and leave the working class and the oppressed masses unrepresented. Though we are small and lack enough resources at this stage, we still want to stand firm on our programme and principles. We want to show the workers, peasants, youth and all the oppressed people that even in these circumstances we can stand firm against the capitalists and continue to demand our rights. The USP has a proud record of taking a principled stand on the national question, at all points defending the rights of oppressed national minorities against repression and discrimination and the right to self-determination, up to and including separation if desired. We do not want to see this stand missing from the campaign or the principled banner of socialism being dipped. There are some who may level the accusation against you that, by standing separately you may attract some tens of thousands of vote. But you will not win. Instead you will divide the vote that could have contributed to defeat Rajapaksa. Without defeating Rajapaksa how can you even think about fighting for any of the left programme that you are standing on? It is correct that people will suffer enormous difficulties after the election if Mahinda wins. But we cannot play with people’s votes. There are many workers, youth and activists in Sri Lanka who feel the same way as we do. They vehemently oppose the Mahinda regime. At the same time they don’t trust the main opposition forces. They will deliver the same thing anyway as they have similar policies for keeping capitalism going at the expense of the working class and poor. This conscious layer will not be interested in gambling with their vote to support the opposition and living to regret it afterwards. They are looking for a lasting solution to all sorts of problems that we face. I and my party, the USP, represent them. They may be relatively small in number – in their thousands – but they are the people who have thought about what they want, not just what they fear, and about how to get it. We cannot let them down. Apart from in my campaign, I am in a position to explain the many activities of my party to expose the Mahinda regime. I was the first to speak out regarding the dangers of unleashing the communal forces in 2005 immediately after I came third in the presidential election then. Our campaign has always given strength to all opposition to the undemocratic regime. On top of this, let me ask a key question. Who can the Tamils and Muslim people vote for? Does the main opposition candidate reflect the aspirations of the Tamils? Is there any candidate standing in the election who is prepared to articulate the demand for the national rights of Tamils? A section of the Tamil masses who believe that demanding the right to self-determination is a way out of the horror they face day by day will not see that they have a voice in this election, if we also desert them to allow a temporary gain for the so-called opposition we have. Even in this difficult situation, we stand firmly for their rights and we will continue to fight for them – no matter what the vote is on the day. But the support we get in the election is not just votes – we see the campaign as an opportunity to lay the basis for creating a mass opposition in the future – a force for achieving what we need to achieve, for creating a society free from all forms of oppression – including national oppression. We admire the USP’s brave and firm stand on the issue of the national rights of Tamils and the rights of the Muslim minority etc. But Tamil leaders traditionally have dragged Tamils into supporting UNP and Muslim leaders have used their support to bargain their own favours with the winning side. This was the case in the Hill Country as well. So you may stand with the programme that they are attracted to, but will they vote for you? True, the Tamil and Muslim leaders have traditionally supported the two main capitalist parties in the south who in turn did not represent the interests of Tamils or Muslims. Tamils have seen many ‘regime changes’ since independence and no gain. Instead, a continued diminishing of their rights. Although the current regime is complicit in the attack against Muslims, some Muslim leaders are still hovering behind Mahinda. But people are beginning to see this hypocrisy. We will try hard to take this message to the masses. Tamil people have registered their strong political voice recently in the provincial election. I hope they do that again. But more than that, I hope they understand the type of battle that they need to take up to defeat this regime and subsequent capitalist governments altogether to achieve their national rights. All of us coming together en-masse is vital to prepare the better future for all, in the way that we want it. Not everyone sees this as the battle plan at this stage. However we are confident that support among Tamils for mass action is growing and they will step forward regardless of what the Tamil politicians want them to do. The opposition is taking it for granted that the Tamils will vote against the Mahinda regime. Based on this assumption, the opposition is not even talking about making basic concessions to the Tamils. Instead they are competing with the ruling regime in Sinhala nationalist terms and their election campaign will mostly concentrate in the south. Our intervention in this election – standing with the Tamil masses along with all workers and poor people, for the right to self determination– will strengthen their confidence. We aim to carry on the work to mobilise the masses not just during the election but beyond the presidential election because we do not see that the solution to the Tamils’ problem will be found through the electoral process alone. In this respect we are not just concerned about the number of votes – but the impact our campaign will have among the people. Tamils have faced horrendous mass killings in the recent past. We want to rebuild their confidence to fight back. We request the media, activists and campaigners to give us support in this regard. Lastly can you say briefly why people should vote for you? Sri Lankan society is going through a serious crisis; we cannot make the same mistake again and again. 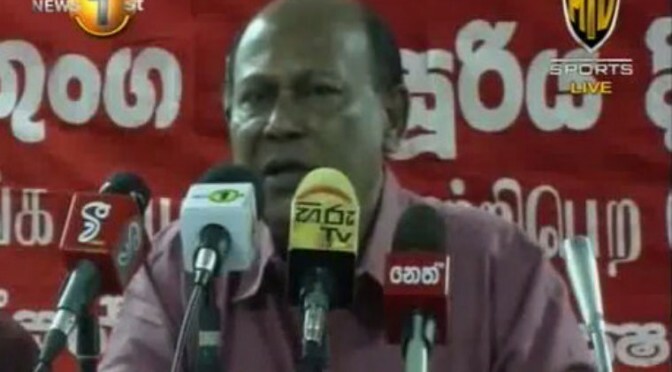 See below, videos of Siritunga Jayasuriya speaking to the press and then to party workers after submitting the USP nomination for the presidential election. Robust Revolt NeededNext PostSaffronisation : Imposition of Hindi and Beyond!